HAROLD VALLEE. The principal newspaper, containing, first, that which everybody wants to know of news concerning their neighbors and locality; second, a review of the happenings of the world in general; and third, formative opinions by a keen, shrewd, editorial mind, is the paper pre-eminently belonging to Greenville and called the Sun. It is so well edited as to merit and receive the liberal patronage of citizens throughout the town and county. The editor of the Sun, whose name adorns the head of this sketch, was born at Fredericktown, Mo., June 4, 1857. He is a son of Dr. John and Emma (Vallee) Harold, natives of Ireland and Missouri, respectively. The former emigrated to America after completing his medical course in his native land. He first settled at St. Louis and later went to Fredericktown, Mo., where he was engaged in the practice of his profession until his decease in 1860. His wife followed him five years later, leaving four children. The maternal grandfather of our subject, John B. Vallee, was the first native in Ste. Genevieve, Mo., of any prominence who could speak the English language and was called by the natives "Vallee L'Engletere" English Vallee. He was a brother of Jean Baptiste Vallee, commander of the Upper Louisiana district, while it was still in possession of the Spanish Governor. As his name indicates, he was a native of France. Our subject was a lad of but eight years when deprived of his mother's care. His father had passed away five years previously. He was reared by his uncle, Joseph Bogy, of St. Mary's, Mo., who was an officer in the Federal State Militia. The young man diligently prosecuted his studies, and in the spring of 1874 he was graduated at the head of his class from the college of the Christian Brothers, at St. Louis. In 1877, he was admitted to the Bar to practice law, and three years later he was elected Prosecuting Attorney for Ste. 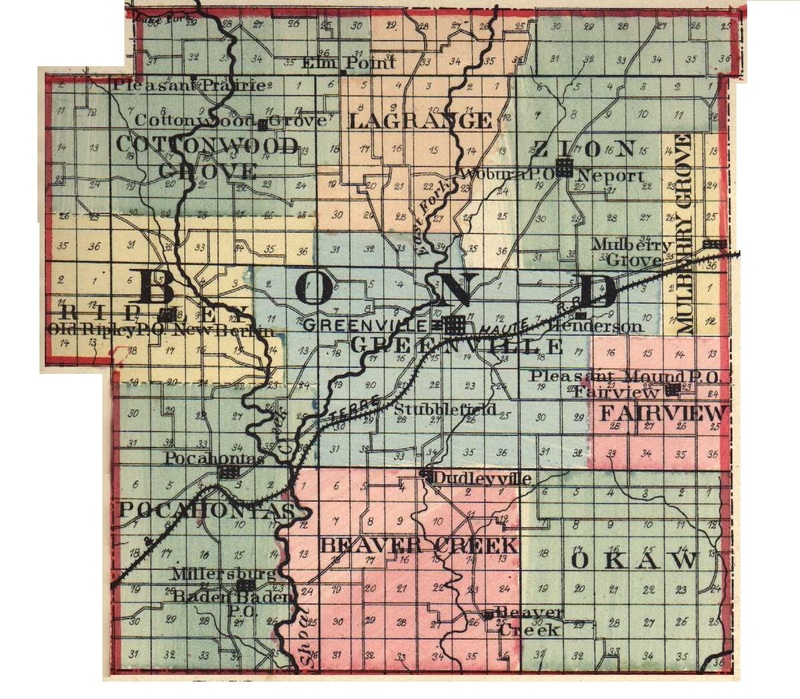 Genevieve County, Mo., and was re-elected to this position in 1882. He resigned the holding in 1884 and came to Greenville. While a resident of Ste. Genevieve, our subject was engaged in publishing The Fair Play for four years, and on coming to this place he purchased the Sun, Four men are constantly employed in the office and extra help is often utilized. In 1888, Mr. Harold was appointed Master in Chancery of Bond County, which position he still holds He is a Democrat in his political belief, and being gifted as a speaker he is frequently pressed into service by his party as a campaign speaker. He holds a high place among the editors of the State. Extracted 21 Dec 2016 by Norma Hass from 1892 Portrait and Biographical Record of Montgomery and Bond Counties, Illinois, pages 445-446.